At NSA this year there were eight of us who did a short comedy routine called Whose Cliché Is It Anyway? Very funny. We didn't have to use the phrase exactly, just the general wording. I recently had the chance to speak at Risdall Marketing Group, an independently owned agency in New Brighton, Minnesota. Here is a testimonial from one of their employees, Josh Dahmes. 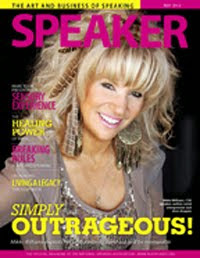 Speakers School is coming up September 26-28. Anyone who gives presentations - sales people, CEOs, educators... can benefit. Here are a few of the many reasons you should attend and make an investment into your speaking career that will last a lifetime! Get more details on my website or register now to reserve your spot, space is limited! 1. Always email your introduction ahead of time to the meeting planner and ask for the name of the person who will be introducing you. Highlight the important parts or the humorous parts, then brief the introducer on how you would like it to be read. Explain they should not deviate from the written copy. 2. A good introduction should tell the audience who you are and why you're qualified on the subject. It should create interest in what you're going to be speaking about. Include your honors but not your résumé. 3. Bad introductions range from "This speaker needs no introduction," to "Here's _________," or (the worst) actually telling the audience that they're going to laugh and cry. 4. Concluders: Many speakers print a concluder on the back of the introduction sheet. This allows a speaker to exit the stage and go to the product table while the introducer is reminding the audience to fill out the evaluation forms, pass them in, meet the speaker at the back table, etc. Looking for more speaking tips? Want to become a professional speaker? 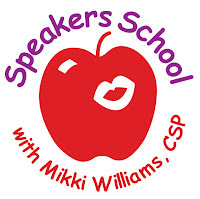 Attend my Speaker's School! I hold three sessions every year in September, February, and April. Visit my website now for more details. Dave Nelsen is scary smart about social media. My brain's about to explode after he spoke to my two Vistage groups this week! If your company needs help in this area he's your guy. Dave has a column in my Ezine every month. Sign up now to receive my monthly newsletter and never his is freaky-good advice! Think You Don't Have Time To Work Out? Well, think again! Have you watched Taking The Lunge? I'm tellin' you, it's the greatest customized fitness plan for busy people! It's been a godsend for me as I fly from here to there and back again, and still get in a workout. And it doesn't matter if the hotel has a fitness room or not. My workout is customized for wherever I am, whatever the circumstances. So cool! Check out this episode and then get your own virtual trainer. I love mine! Visit me on my website! Just enter your email address and my posts will magically appear in your inbox! Who am I? I'm a certified professional speaker, a trainer, an executive, a business/life/presentation skills coach, a small business consultant, a Vistage speaker and Chair, an avid networker, a blogger, a writer, an animal lover, a people person, a loyal friend, a mother, a dancer, a movie and theatre buff, a gourmet cook, a shoe diva and a “mensch.” BTW, I never met a sequin I didn’t like.